Mr. Henderson donates $5 and is sorry to learn about the dormitory fire. 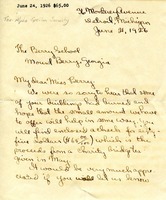 Miss Frances Robinson treasurer from the Tau Alpha Episilon sorority wrote a check for $65.00 to the Berry School located in Mount Berry, Georgia. This check was a small amount from a charity bridge tea to help with some buildings that had burned down. 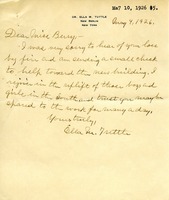 Letter from Dr. Ella M. Tuttle to Miss Berry expressing her support for Miss Berry in her time of need due to a fire. 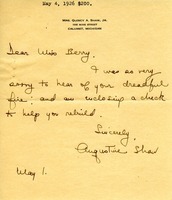 Martha Berry asks for a donation after one of her dormitories burnt down. M. Valentine sends back $50 to help rebuild it. 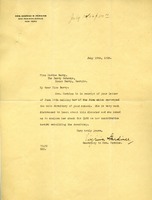 A.G. Thatcher and Mary H. Thatcher said $100 each to help with the rebuilding of the boys dormitory that burned down in a fire. 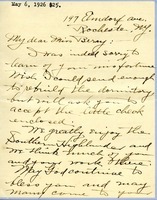 Edith Talbot is very sorry about the fire in the dormitory and she sends a donation of $25. Annie Luiderell is very sorry about the dorm fire and she sends her love and $500 to help rebuild the dorm. 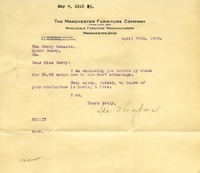 Martha Berry asks for donations to rebuild the dorm after a fire and Mr. W. Thompson sends $50. 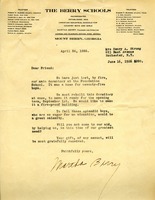 Martha Berry asks for donations to rebuild the dorm that burnt down. Lydia Stokes sends Martha Berry a $100 to help cover the cost of the recent fire. Mrs. Shaw donates $200 to help the Berry Schools rebuild after the fire. Mrs. Phillips sends sends $200 to Miss. Berry to rebuild the boys dormitory that burnt down. 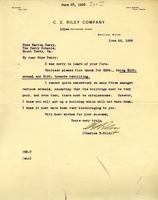 Charles E. Riley encloses $200, $100 for his annual donation and $100 for rebuilding the burned dormitory. He says that he cannot understand how so many dormitorys burn at schools, saying they must be very poorly built and there must be careless mistakes. 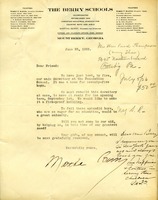 Alice E. Richardson writes that she is sending $2 for the rebuilding of the building lost by fire. 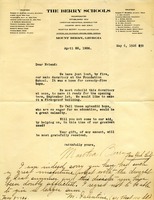 She adds that she wishes she could send more, and hopes that the "required sum for rebuilding" will be collected. 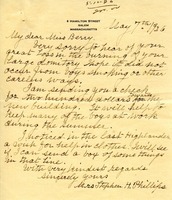 The secretary for Mrs. George W. Perkins responds to Miss Berry's letter about the dormitory destroyed by the fire. Mrs. Perkins then donates $100.00 towards the rebuilding of the dormitory.